“The Hinomaru, officially called the Nissho-ki (sun emblem flag), is said to date back to an imperial banner used in 701 AD, making it one of the oldest national flags in the world—although its status was only made official by an act of the Diet in August 1999. 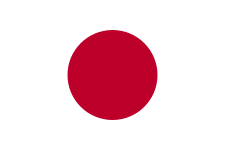 The national flag of Japan is a white rectangular flag with a large red disk (representing the sun) in the center. This flag is officially called Nisshōki (日章旗?, “sun-mark flag”) in Japanese, but is more commonly known as Hinomaru (日の丸?, “circle of the sun”). The exact origin of the Hinomaru is unknown, but the rising sun seems to have had some symbolic meaning since the early 7th century. (It should be noted here that Japan is east of the Asian continent, and that the sun rises in the east.) In 607, an official correspondence that began with “from the emperor of the rising sun” was sent to Emperor Yang of Sui. Japan is often referred to as “the land of the rising sun”. In the 12th-century work, The Tale of the Heike, it was written that different samurai carried drawings of the sun on their fans. One legend related to the national flag is attributed to the Buddhist priest Nichiren. Supposedly, during a 13th-century Mongolian invasion of Japan, Nichiren gave a sun banner to the shogun to carry into battle. The sun is also closely related to the Imperial family, as legend states the imperial throne was descended from the sun goddess Amaterasu. One of Japan’s oldest flags is housed at the Unpo-ji temple in Yamanashi Prefecture. Legend states it was given by Emperor Go-Reizei to Minamoto no Yoshimitsu and has been treated as a family treasure by the Takeda clan for the past 1000 years, and at least it is older than 16th century. The earliest recorded flags in Japan date from the unification period in the late 16th century. The flags belonged to each Daimyo and were used primarily in battle. Most of the flags were long banners usually charged with the mon (family crest) of the Daimyo lord. Members of the same family, such as a son, father, and brother, had different flags to carry into battle. The flags served as identification, and were displayed by soldiers on their backs and horses. Generals also had their own flags, most of which differed from soldiers’ flags due to their square shape. In 1854, during the Tokugawa shogunate, Japanese ships were ordered to hoist theHinomaru to distinguish themselves from foreign ships. Before then, different types of Hinomaru flags were used on vessels that were trading with the Americans and Russians. The Hinomaru was decreed the merchant flag of Japan in 1870 and was the legal national flag from 1870 to 1885, making it the first national flag Japan adopted.. The flag is a symbol currently fraught with WWII Japanese empire-associations … see Korean campaigns for removal of Japanese flag from French stores (JapanToday, Jun 20, 2013).